Founded just after the Greek revolution, in 1821, when refugees from other islands (Chios, Psara, Kassos) and Ayvalik inhabited the island. Since 19th century, Ermoupolis (capital of Syros island) is considered to be as the most important financial and marine centre of that time. 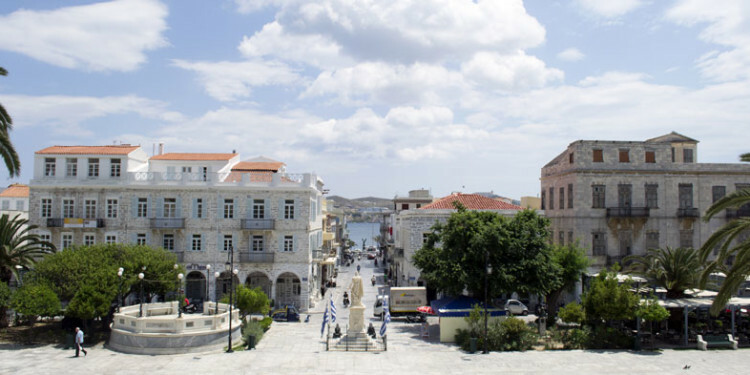 In 1833 becomes capital of Cyclades perfecture and Neofitos Vamvas establishes the first high scholl in Greece where later Eleftherios Venzelos gratuated. Later on, in 1854 at its shipyards the first greek steamboat is manifactured and at the same time merchand and insurance markets are growing rapidly. Neorion Shipyards in great extend are responsible for the economic growth of Ermoupolis. Built in 1860 and still active, with modern tools and techniques for ship built, maintanance and repair. At the central “Miaouli” square with tall coconut trees, the statue of admiral Miaouli and the platform of town philarmonic orhestra, stands the TownHall, a majestic, neoclassical builting made under the instructions of famous Bavarian architect Ernest Chiler back in 1876 and openned in 1898. Nowadays, social, municipal and judicial services are hosted. 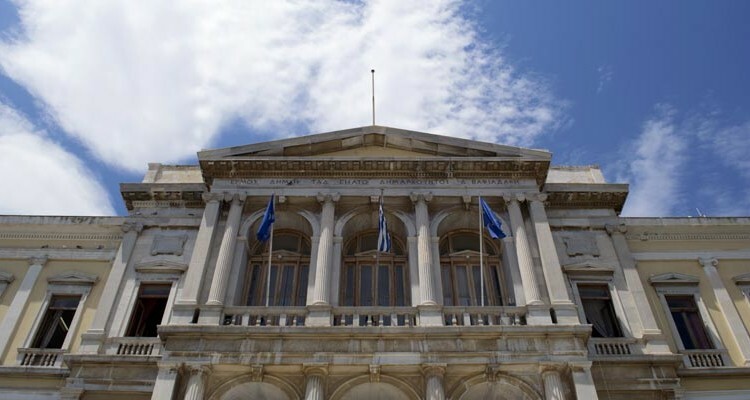 The archeological Museum is located in the left side of the TownHall, and next to it the Cyclades Historical Chancery with important document collection. Opposite to the entrance of the Chancery there is the statue of our ethnarch Eleftherios Venizelos. On the right side of the TownHall, we meet the building that used to belong to former club “Hellas”, a neo-classical building since 1864. Today, hosts the Ermoupolis Spiritual Center and a lot of famous world conferences, lectures and exhibitions are organized there. In the same building, the Public Library is decorated by the statues of important greek writers. In Vardakas sq. we will meet the famous Apollon theater. It is a micro-replicant of Scala in Milan and it had its great openning back in 1864 with Verdi’s Rigoletti Operah. Metamorfosi Sotiros, the oldest church in the island that started to built in 1821 and finished in 1831.It is the metropolitan church and keeps valuable treasures and icons from the 19th century. Also, the church of Kimisis Theotokou where an early painting of Dominikos Theotokopoulos representing our Lady is proudly held. Besides, the majestic temple of St. Nikolas, in front of which is the monument of the unburried soldier in memory of the anonymous heroes of the Greek revolution in 1821. On the back of St. Nikolas church is the superb neighbourhood “Vaporia”, that is considered to be one of the most picturesque areas in town and ends up to the church of St. Dimitrios. And the orthodox church Anastasi at the top of the hill Dili, with amagnificent view, built in 1845, that stands opposite to the catholic metropolitan St. George church, as a symbol to the harmonic coexistence of the two dogmas in the past and present times. The room was clean and very nice with balcony. View from the roof garden is excellent.The price was very economic.The neighborhood is very quiet and trees in the garden give wonderful shadow. Also there is a small kitchen where it’s possible to prepair tea or coffee for free. The owners are very friendly and helpful! 3 Omirou Str & 20 Petrokokkinou str. Hermoupolis - Syros, 84100, Greece.